showcasing the works of composers at the Birmingham Conservatoire. It took place at the church of St. Martin in the Bullring which is situated in the heart of Birmingham’s city centre. The idea of music bring people together was evident. 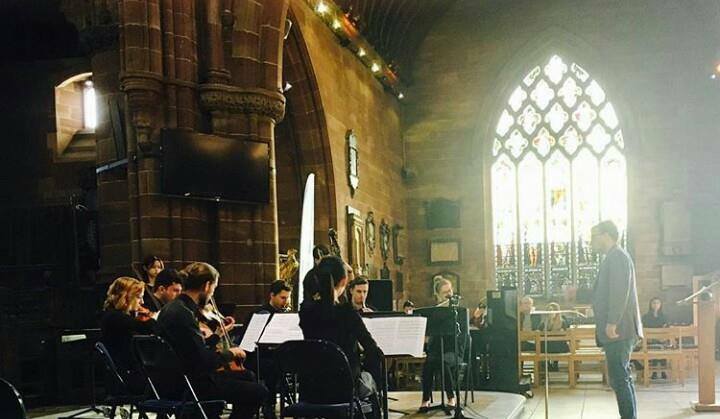 This lunchtime concert was very much a community concert; the audience included the general public as well as fellow students and members of the church. Joshua Dowling, composer and music technology student had two of his pieces performed in the concert. A choral scholar at Bromley Parish church from age 7, Joshua grew up in London before coming to study in Birmingham. In addition to singing he played oboe with Bromley Youth Symphony Orchestra. Being half American, Josh often spent summers in Pennsylvania – to this, he attributes his interest in 20th century music of the Americas – central America i.e. Mexican music, Canadian folk, Steve Reich and minimalist music. Aside from music, Josh’s other interests include running (members of his running club even attended the concert). Despite formally studying on the music technology course at the Birmingham Conservatoire, Josh definitely sees himself as a composer. Studying the two, Josh doesn’t see any barriers between them and is keen on exploring multi-faceted music and using music as a means of communication. As a child, Joshua said that he was always wanting to do different things – doing both music technology and composition, in addition to always wanting to fuse different musical elements together is only a natural manifestation of this. January’s lunchtime concert proved a real labour of love for Joshua. It is was in this concert that he truly explored and demonstrated different areas of work i.e. exploring writing for larger ensembles in his piece titled “Danaus” (this was conducted by composer Chris Creswell). Josh is eager to explore polystylism, intertextuality as part of his creative portfolio. The Pillar of Cloud’ is an electroacoustic realisation of a four part SATB choral piece ‘Lead Kindly Light’ composed by Joshua Dowling for the season of Epiphany. The words for Lead Kindly Light were written by Cardinal John Henry Newman when he became ill in 1833 while visiting Sicily. He was desperate to return home to England but no boat was available for three weeks. While waiting, Newman visited various churches but according to his writings, attended no services. Once on a vessel heading back to England, Newman saw a light from a nearby harbour and was prompted to write a poem, titled ‘The Pillar of Cloud’ expressing his desire for guidance in a difficult time. The choral setting was performed by Lily Allen Dodd, Lufuno Ndou, John Eclou and Joshua Dowling. The electroacoustic realisation followed. Danaus is a piece for chamber ensemble which embodies the life and migration cycle of the species of butterfly more widely known as Monarchs. Between September and November, northwestern Monarch populations migrate annually from southern Canada to central Mexico. They remain in their overwintering sites until March before returning to Canada in June or July. Five generations of Monarch are present on this journey at any one time. This piece draws inspiration from works by notable composers of the 20th century Americas including Canadian folk music and the use of minimalist procedures. In addition to Joshua Dowling’s pieces, the concert included The King Quintet, a newly formed ensemble this academic year. They performed Haydn’s Quintet No. 2 and a new piece especially commissioned for the ensemble – ‘Viva’, composed and conducted by BMus 1 composition student Georgia Denham. Composer and pianist Hannah Liu also performed her composition “Wondering”. Move on, or stay? What do you think? There is always a voice in your heart, but still unsure…wondering. Hannah Liu plays one of her own compositions for piano – Wandering.